Time for another Inspired by feature and if you are a regular reader you know what that means. I'm going to share an illustration inspired by the blogging world. It's basically a blog recommendation accompanied by my art, usually my fashion illustrations. A fun feature, isn't it? Today post was inspired by blog Jodie's Touch of Style. Jodie is a blogger who typically shots outfit posts together with Charlotte and Nancy. Sometimes they also feature other ladies on their blog. Anyhow, all three of them have a great sense of style. They show us that you can always have fun with clothes! I wanted to illustrate them for a while, and now I have finally made the time and made two fashion illustrations. These illustrations are what I'm going to share with you today. As I said, I have prepared two fashion illustrations for you today. I have drawn one of them in the typical 'fashion illustration' elongated style and the other in a semi-realistic style. The first stylized illustration depicts Jodie and the second drawing depicts all three of them: Jodie, Charlotte and Nancy. Scroll down to see more! 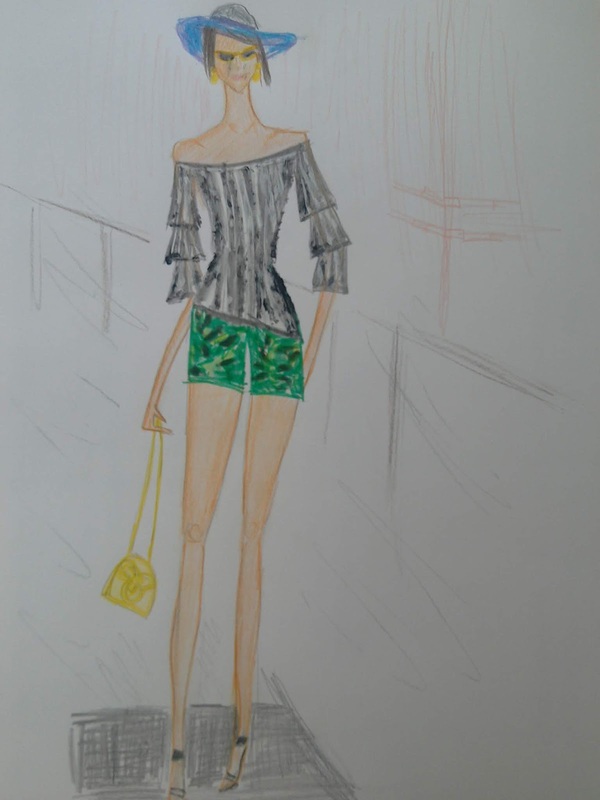 The first illustration I'm sharing is a fashion drawing of Jodie, done in the fashion illustration style. This illustration was inspired by the last outfit Jodie shared. I do like the yellow accents in this look, the yellow bag and earrings. Lovely camo shorts as well. It's a look from their camo themed post, and you can see how the three of them styled it here. I wanted to drew all of them in this style, but I was short on time and it was a few days since my last post. Maybe next time. 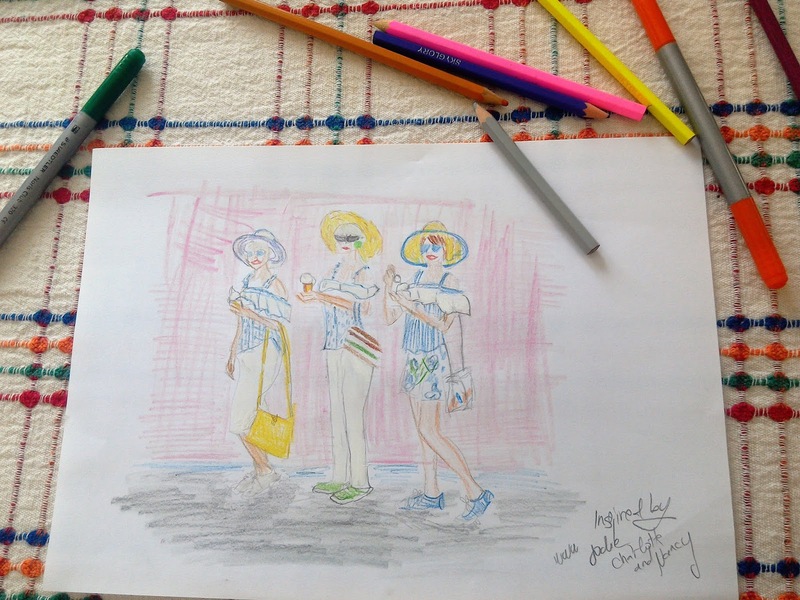 I do have another fashion sketch of three of them together and that's my second illustration of the day. The second illustration is more of a sketch, but I think it turned out alright. 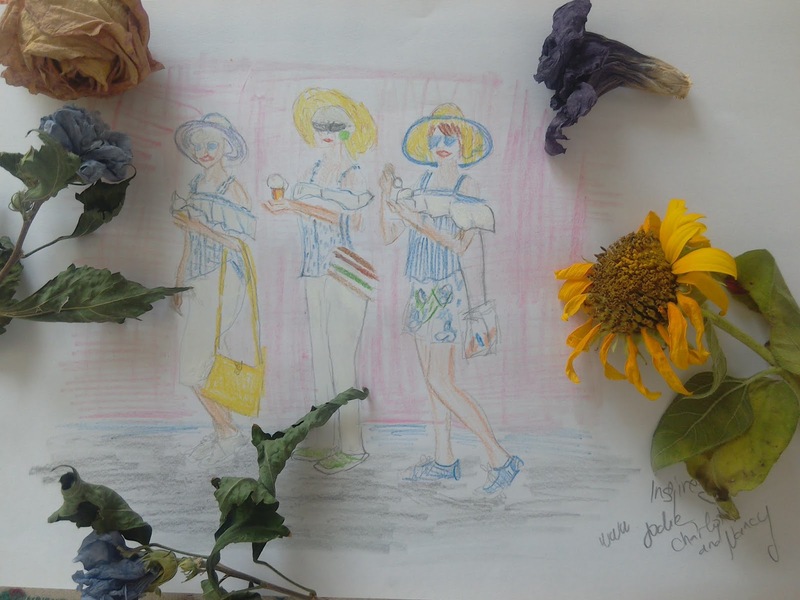 This fashion sketch depicts three ladies, Jodie, her mother Charlotte and stepmother Nancy. This illustration was inspired by their post from 22nd of August. It shows the ladies wearing amazing open shoulder tops that Charlotte sewed herself. I'm currently in fashion sewing school myself, so I it is great being able to see and draw hand made items. I do like these outfits, the yellow accents are fabulous and an ice-cream is always a great photo prop. Maybe in the future, I'll do another fashion illustration of these outfits in a larger format. 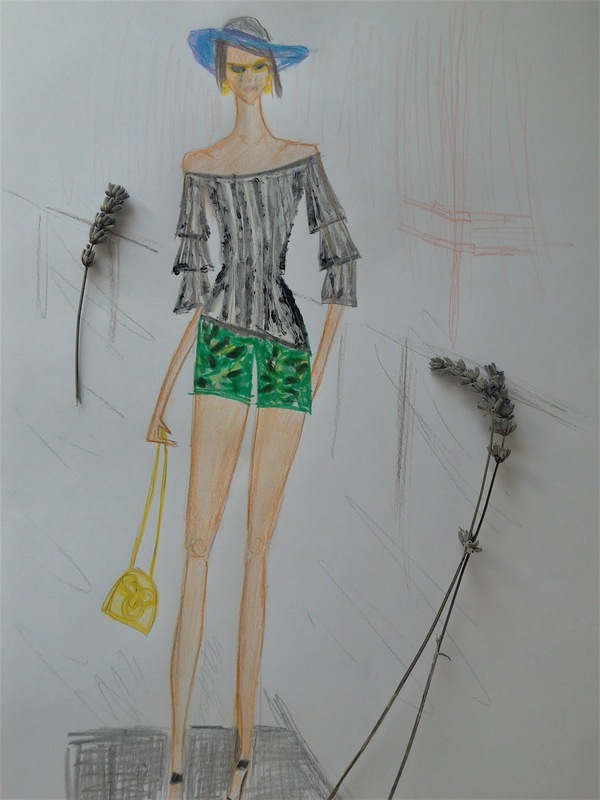 How do you like these fashion drawings? Do you like the outfits I illustrated? 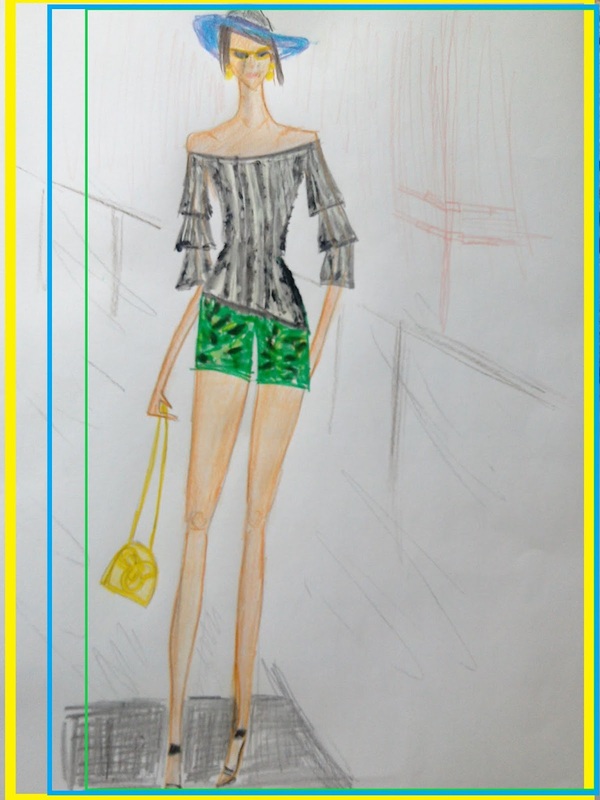 The medium for both of these fashion illustration is coloured pencil on paper. I also used markers to add some finishing touches. The first drawing I shared was drawn on a paper from my sketchbook, the format is approximately A2. The format for the second illustration is A4 and it was drawn on ordinary printing paper. That would be all for day. Today post won't be very long. Just my 'Inspired by' drawings and that's that. Let me know how have you been? I'm in so much pain that I can't even think straight, let alone put it in words. Living with an immune disease just never get easier and that's a part of my life that I can't help but hate. But let's talk about something more uplifting. How do you like this feature? Would you like to be featured yourself? I can't promise anyone anything, but you never know- some day I might draw you to. Thank you for visiting this little digital place I call my own. Oh, I do enjoy your 'Inspired By' fashion illustration posts! The flared and layered sleeves on this blouse look lovely and they must have been a lot of fun to put down on paper :) Hope you're having a fabulous week so far, Ivana!! Oh, Ivana!! You don't realize how heart warming this is. I'm going to include it on my monthly recap post!!! I like your drawings very much, dearest Ivana - pretty outfits and I notice that in all pictures the ladies are wearing chic hats! Great! Oh that's sweet of you! I follow Jodie too! Oh, dear Ivana! For sure I like the outfits you have illustrated! You are definintely talented and the outfits beautiful as well. Thanks a lot for sharing. Very inspiring. The pictures are amazing! You do such a good job with your illustrations Ivana! Your illustrations are great as always! I hope that you are having a wonderful week and that your pain gets easier to manage, it must be so frustrating for you. You have captured Jodie and the ladies so beautifully Ivana. They sure are such inspiration. Wonderful illustrations! Jodie and her girls are so lucky to be illustrated by your talented hands my dear! Love the illustrations.. Are you a fashion student? I'm not a fashion student, but I'm taking a fashion sewing course. These illustrations are so neat!! I recently purchased a sketch book myself and have been meaning to get back into drawing again. I'm so out of practice. Oh Ivana, I am so sorry to hear that you are in such pain. You are SUCH a positive person and I know that must be especially hard on you since you have a zeal for life and doing lots of fun things. Sending you many best wishes and will keep you in prayer. Your illustrations always impress me, you are so dedicated and I like the colours. I do like the way you have featured the 3 women together- they look fab. AND you are in Fashion school? How cool to make your own! I started fashion sewing school but I had to take a break because of health problems. I love the inspired by fasion post - so cute ! Ti faccio i miei complimenti... sei bravissima!!!! Have a happy new week, dear Ivana! Great job! You definitely have a beautiful gift! I like reading your "Inspired by posts" the illustrations are normally so beautiful. Kisses! That is a cool sketch, I actually like fashion illustration and this is the perfect picture for it with the wide hat and dangled bag. I love the outfits you picked to illustrate! Looks beautiful! Love all the content you're sharing lately, and love specially when you take inspiration from bloggers to create new illustrations. I like to see the real version of the look in the IG photo and then how you interpret it through strokes, paper and different materials! I like the colours and specially the last illustration with the 3 women together.... they look like the best fashion squad! I'm also a friend blogger of Jodie and her mothers. I saw this look from Jodie and I loved the look of the three with the off-shoulder blouses sewn by Charlotte. I also have a passion for illustrations although I think you draw much better than I do. They are very inspiring and I bet they will love this that you have done for them. I realize your health problem, now that I have discovered my health problem I have to have appoitments in a hospital that is a 200km from my house, because as it's a rare disease there are few medical specialists in this disease. I am waiting for they call me to finally start a treatment that I still do not know well what it will be. thank you Marisa. I hope you'll find a treatment that will help. Fantastic post, dear! This looks wonderful! You are very talented. 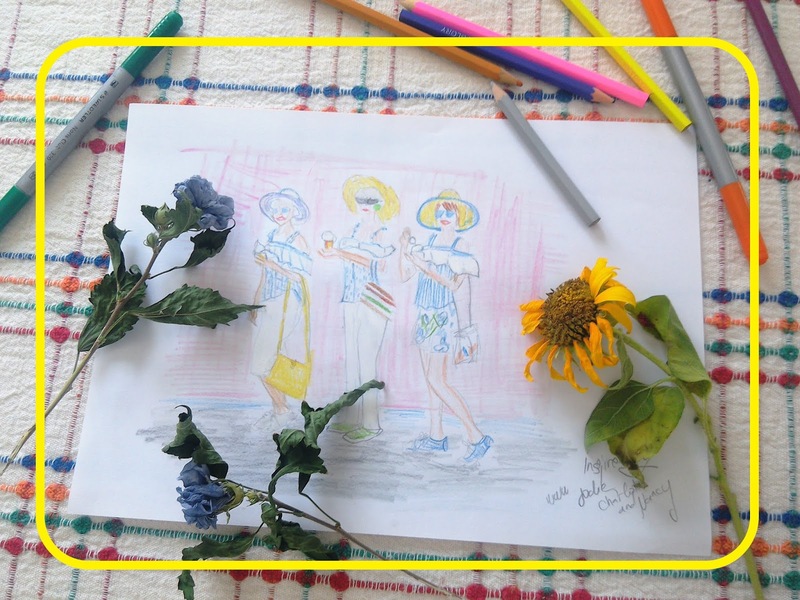 Hello dear, I am pleased to see how you have evolved in the fashion illustration and now you are studying sewing, congratulations! I liked both illustrations. The picture is amazing! Love it so much. Great illustrations. I like the second one and how you captured all three ladies. 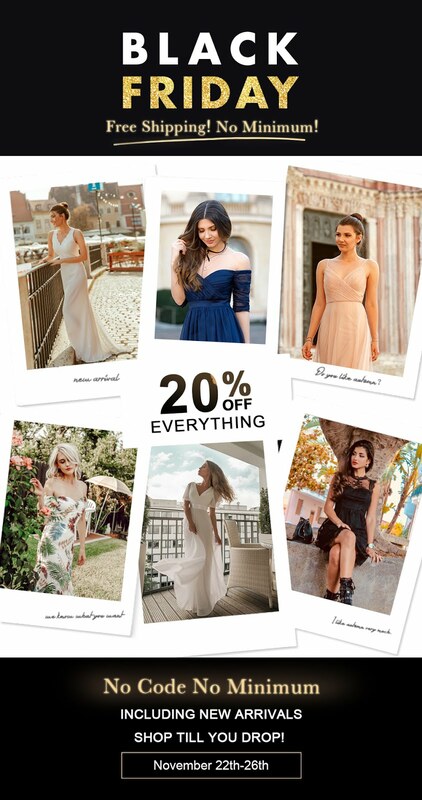 Great ideas, I love these outfits and styles. I would really love to see them arround. Mi dispiace tanto per i tuoi problemi di salute e spero tanto che la situazione possa in qualche modo milgiorare.... Tu continua ad esser la persona forte e positiva che sei, sei un'esempio per tutti noi! Oh wow! You are so talented! Love how you drew Jodie, Nancy and Charlotte. Would be such an honor to be drawn by you!! Non conosco Jodie, ma i tuoi disegni sono sempre bellissimi! I love all of these! honestly one of my goals are to be featured on this segment of yours - I need to start learning how to dress up properly haha. the way you always photograph flowers and little bits and pieces with your drawings are always super cute. I also really like how I have the opportunity to see you get better at this as well! you've always been good but I feel like you're definitely falling into your own style more and I literally adore that! I'd love to draw you some day. I love your inspired by series Ivana. I do not know these beautiful ladies but you did them justice with your work. I do love the yellow accents as well. They all look very stylish. thank you, I do plan to draw you some day. Some lovely illustrations here, I like your personal fashion illustrative style. I have a BA in styling and fashion illustration so this appeals. thank you Laura, that means a lot to me. Love those paintings hahah, so much inspiration! Your drawings are so much fun these days. I feel there's more fluidity, texture, colors and everything that makes them jump out at us visually. I love these. I'm sorry that you are in so much pain. I hope you take the time to just simply be and take the right course of actions during this challenging time. Be with your body as it needs you. And yes, I would love for you to do a drawing of me one day in the future! It would be super cool and I know I will love it :) Sending you a lot of love and restorative energy..
thank you dear, I'll make a mental note of it. I'd love to draw you some day. Amazing! This drawing really looks so pretty!